Professor Michael Fuller (St. Louis Community College) visited the Luxor Museum on 9 March 2001. He was particularly interested in the Talatat (small decorated sandstone blocks) discovered as fill within the 9th pylon of the Karnak Temple. They are of great significance because they date to the reign of Amenhotep IV (Akenaton). Akenaton and his mother, Queen Tiy. Assembling and counting Temple/Palace stores. Architect and builders with columns. Jars being carried for storage. Force feeding cattle near grainery. Twice the size of servants is Akenaton. 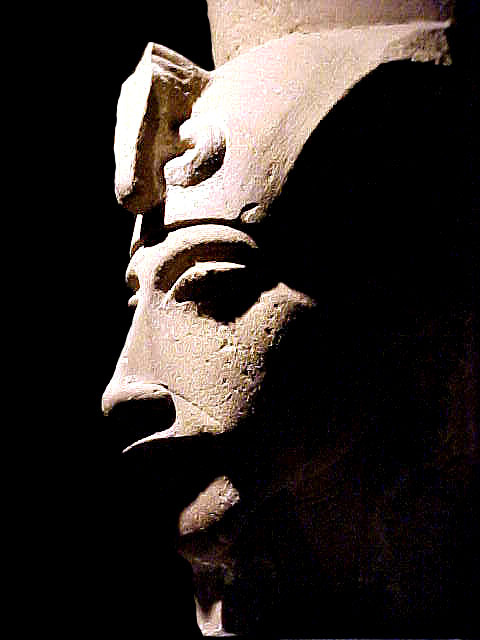 Colossal Head of Akenaton from East Karnak, in Luxor Museum. Colossal Statue of Akenaton from East Karnak, in Cario Museum.